Memorial Day took me by surprise this year. I was so busy with personal and professional stuff, that Friday arrived and I had no plans for the long weekend (in the US, Memorial Day - usually a somber and sad day in every other country - is celebrated with barbecues, trips and a long weekend). I opened Google Maps and looked for a large green or blue spot within driving distance (Yosemite on my last trip ). I heard about Lake Tahoe before, and decided to pay it a visit. The lake stretches along the border of Nevada and California - which meant I was to Nevada twice in a week, having visited Vegas not 2 days before (for business - no gambling for me, unless we're talking about stocks ). I did not check the weather forecast. It was a ghastly, cloudy weather throughout the weekend, with infrequent cold showers. Dashed were my plans to swim in the lake. Reno is not a great choice if you're interested in Lake Tahoe. Reno itself is a drab, gray city, trying to be Las Vegas (casinos, shows etc.) but (in my humble opinion) failing miserably. I started my long drive (237 miles) on Saturday morning. My path took me toward Sacramento, and then up to the Sierras - where it was still lightly snowing (in the end of May!) and down to Reno on the other side. The trip takes you through wonderful vistas (not the operating system) of mountains, plains and desert. 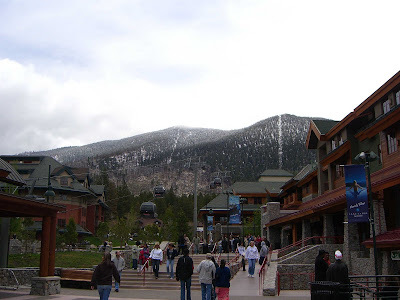 The trip from Reno to Lake Tahoe will take you through Carson City (where you can see the governor's house, if you're so inclined), up the mountains, and down towards the lake. The trip through the cloudy, snowy peaks and down to the lake reminded me first of my trip to Switzerland and then, for some reason, of driving down to the Kineret in Israel (also known as Sea of Galilee) - and indeed, within 5 minutes I saw a road sign pointing to Galilee - guess I wasn't the first with that thought. I stopped on the shore of the lake and tried taking some pictures. 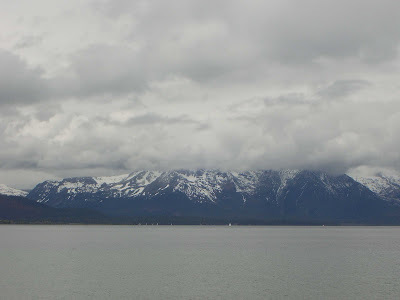 But due to the clouds, they all came out gray, showing the same empty lake, with cloud-covered mountains in the background. The town to stay in is South Lake Tahoe. It's right after the state line, so I guess it's considered California. It looks nice and touristy, with access to both the lake and a ski site (if you're into hurtling yourself down a snowy mountain ). I'll try to stay there for my next Lake Tahoe trip - and there will be another one. On the way back I did try to take the Reno River Walk - but was not too impressed. Well, you can't have all your trips be amazing, otherwise, how would you appreciate the truly exceptional ones?